Window Cleaning Safely Carried Out At Height. Window cleaning has changed a lot in the past 5-10 years with the breakthrough of new technology, notably the Reach & Wash window cleaning system. As early adopters of this system we have been able to move forward with the new technology. This has seen many benefits for us as a company and our customers. We can take good care of cleaning your commercial buildings windows. We have a variety of methods at our disposal, to do a professional and safe job. 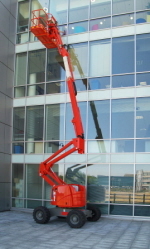 As professional window cleaners we know that Cleaning windows on industrial buildings can be especially demanding. Over the years we have learned to deal with cleaning windows on all sorts of buildings. So you can be confident that as professional window cleaners we can easily deal with keeping your windows sparkling clean. Over the years we have become very proficient at cleaning windows on Retail Premises. Whether your premises is down a narrow street or a busy main road we can keep your windows in pristine condition, safely and efficiently, using our up to date cleaning systems. We offer a fast efficient service to clean the windows of your dwelling, whether it is a small bungalow or a large 4 story house. Most domestic window cleaning work is carried out using our efficient water fed pole system and where it is needed, we can still use ladders. We offer a fast and efficient window cleaning service for your Office, whether it is a small office building or a large multi story office block. Most office window cleaning work is carried out using our highly efficient water fed pole system and where it is needed, we use up to date equipment for high rise buildings.